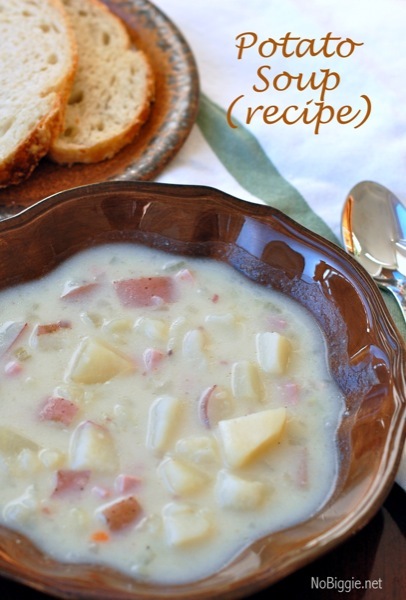 This Potato Soup is pure comfort food to warm you and your family on those cold winter nights. It’s creamy and hearty and easy to serve up. It’s one of those soups that are perfect for when you want to bundle up and stay inside on a cold winter night. In a large stock pot combine potatoes, onions, celery, chicken broth, soup base and salt and pepper and enough water to barely cover all ingredients. Bring to a boil and simmer on medium heat until potatoes are tender. Add half and half, cream of mushroom soup and stir until creamy. Adjust seasonings if needed. May add cheese and bacon, but I like it plain. We got sooo much snow over the weekend. My kids were thrilled! They played outside nonstop. It’s crazy how our weather jumped from the 70s on Wednesday to full on Winter Wonderland this weekend….and it begins…Happy Winter! Looking for more delicious recipes? Visit our recipes page for all our favorites. Oooh, Kami, this looks SO good! I am making this next week! Thank you. This recipe is delish and it can it is vegetarian. So good. Yum, yum! I love soups and I will for sure have to try this one! Thanks for the recipe! 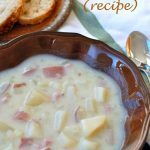 I love potato soup but I haven’t been able to find a recipe that really hits me as my favorite “go-to” soup. I’ll give this one a try. Thanks for sharing it.